ROM Hacking Discussion / Re: Is there a tool that can edit compressed Game Boy graphics? I would do a compression bypass hack, which first requires you to reverse engineer the compression format and then to hack the code to allow for uncompressed graphics. It's generally an advanced hack, but not an impossible one and very doable in my opinion. This is a good idea, but it's definitely something that's beyond my skills. I might post in the Help Wanted section in a few days/weeks when the title screen is the only thing left to do. ROM Hacking Discussion / Is there a tool that can edit compressed Game Boy graphics? 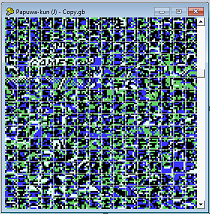 I want to edit the title screen of Nangoku Shounen Papuwa-kun: Ganmadan no Yabou, but none of the tile editors that I've tried have been able to display it properly. I can find a small part of the logo where it says "GAME BOY" (but only the top half), although nothing else around it looks anything like the rest of the title screen. I'm not entirely sure if this is because of compression or not. I certainly can't find the ガンマ団の野望 part of the logo anywhere in the ROM. Does anyone know of any tools that could display (and edit) this in a clearer fashion, or have any other suggestions for me? Thanks. Thanks for the offer, Pennywise. I'll let you know if I need any extra space. Good suggestion, I'll give colons a try once I've completed all the dialogue sections. I've been working on this on and off by myself for a while now, but have been putting in some extra effort lately to try and get it finished and ready for release. Right now, I'd say the project is around 75% complete. The text sequences between stages are quite funny and are actually my favourite part of the game (the gameplay is decent, but nothing special), so hopefully some people will be curious enough to play it when everything's prepared. CUE, did you get my PMs? I sent 2 but they're not showing up in my sent box. Thank you for the explanations. I think I understand it now, but there's still something funny going on. So I padded my copy of this file to 26624 bytes in Translhextion, and edited the reverse/normal hex referring to the file size in the ISO. Then I tried mounting the ISO and seeing if the game would start like this. Nothing. At this point I opened it in CDmage and imported the file I'd expanded earlier, then saved the change. Mounted again, back to the emulator, still not loading. Assuming I'd done something wrong, I made a new copy of the ISO and tried using Sephiroth 1311/Phoenix's program again (being sure the LBA matched because the game has 2 files called TEXT2.BIN in separate folders), and it reported that everything was successful and it had chaged the TOC and ECC/EDC (I'm not sure what ECC/EDC is). The game still wouldn't load. I can replace the files after editing them, but as soon as I increase the size of a file, the game stops working. What could be causing this? All others files are in the same position (LBA)? 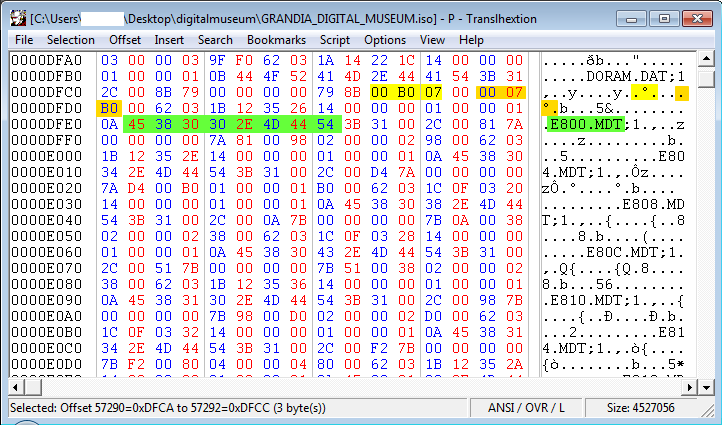 Check the file "CDDA1" in the root, a CD DA file pointing to the music track. The game can crash if this LBA is modified. I'm just doing what I wrote above. I'm not changing any LBAs as far as I know. Yeah, the LBA for CDDA1 is 193,769 on both the original and modified ISOs, it hasn't been touched. Can you convert your MODE1 ISO in a MODE0 ISO with the music track in another file (MP3/WAV format)? I have a tool to modify a MODE0 image with modified files, even changing the number of sectors occupied. I wouldn't know where to start with that, and doesn't Grandia use a special kind of compression for its audio? Digital Museum is based on the original game's code. How do you conclude that KERNEL.BIN is the next file? Is it because it has the next biggest LBA in the folder, or because it was the one that came before the one you wanted to expand in the TOC? And why would the ISO stop booting in the emulator if I was only making the file 1 byte bigger? You do have to change the hexadecimal values in both forwards and backwards formats, right? Edit: Eh, it looks like there's some kind of checksum going on somewhere. As soon as I change one byte that represents the file size, regardless of whether or not I import a file in CDmage, the entire ISO will no longer start up in the emulator. and CDmage was reporting the random new filesize I decided to give to this file (505,000 bytes). After saving, recompiling and mounting the ISO, Windows was happy with it but the SSF emulator wouldn't start the game (it was able to load from a save state and then work as normal, however). When I tried this last night, I tried a new file size of 508,000 and after mounting the image, Windows was giving me an error message whenever I tried to open the FIELD/ folder containing the file I'm trying to expand. I guess this is possibly because I was overwriting part of another file by overexpanding the one I was working with. ...Well, the LBA of the file I'm trying to expand is 31,115 but how do I know what is "the next file to be expanded"? From the example I understood that it means the file listed previously in the TOC. This leaves me with -237568 bytes as my maximum file size, which obviously isn't right. Does anyone know how to calculate the maximum filesize like this for Saturn games (Mode 1/2352 ISOs), or am I approaching this in the wrong way? Edit: Yeah, the ISO stops working if I import a file that's even 1 byte bigger than the original. Also, when I mount the ISO after making my changes, Windows reports that the edited file is still the original size. There must be a check going on somewhere, right? News Submissions / Re: Translations: Grandia: Parallel Trippers (GBC) English Patch Complete! I tried! I installed another browser.Downloaded the file without any problems.The issue is only with IE.This is the first time it has ever happened to me. If anyone else is having trouble with this link, there's also a mirror at http://goo.gl/fqMtK. This game plays somewhat like a Zelda game with Dragon Quest-style battles.